Metabolic Alkalosis is a condition where your body (usually the kidneys) either 1) gets rid of too much acid, OR 2) retains too much bicarbonate (HCO3-, a base), to the point that the blood pH rises above 7.45. If the body is getting rid of too much acid, then the available bicarbonate will continue binding with the remaining acid and neutralize them. However, in alkalosis, this still leaves extra bicarbonate floating around, which results in the pH increase! Obviously, if there is simply too much bicarbonate being retained in the body, then it will run out of available acid to bind with. That’s another pathophysiological cause for the blood pH to increase. 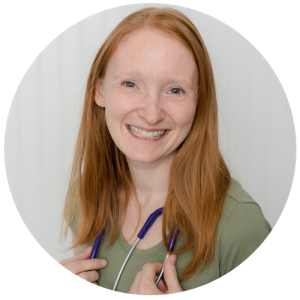 Your blood can become more alkaline for other reasons, too (like Respiratory Alkalosis!). But when your blood becomes alkaline because of something related to the kidneys or digestive tract, that is what makes it Metabolic Alkalosis. How is Metabolic Alkalosis diagnosed? What are the different types of Metabolic Acidosis? Metabolic Alkalosis is primarily diagnosed using an Arterial Blood Gas Test (ABG), especially if the patient is showing symptoms of the condition OR has an underlying illness that might put them at risk for this imbalance. In order to identify which type of acid-base imbalance the patient has, you will need to know how to interpret ABG values. 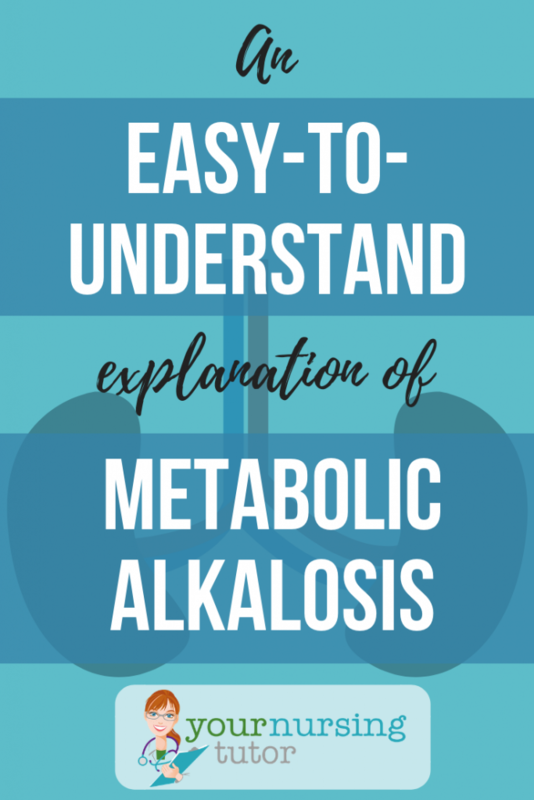 Uncompensated Metabolic Alkalosis is the initial stage that occurs when the kidneys are no longer able to maintain normal blood pH, but the lungs have not been able to compensate and adjust the pH back to normal range yet. Under normal circumstances, the lungs help the kidneys maintain correct blood pH by retaining or producing carbon dioxide (CO2). CO2 is “followed” by H+, which is acidic. Both components can be retained by the lungs, which increases the total amount of acid in the body, thereby counterbalancing the excess HCO3-. However, in uncompensated Metabolic Alkalosis, the lungs have not yet begun responded to the acid-base imbalance in the blood. The result is that there is too much HCO3– in the blood, but there is still a normal amount of CO2 (and H+), and the blood pH rises above 7.45 to become more alkaline. Fully Compensated Metabolic Alkalosis usually comes on more gradually after Uncompensated Metabolic Alkalosis has occurred. The slower pace of this acid-base imbalance allows time for the lungs to retain enough CO2 and H+, which counterbalances the increased HCO3-. Retaining more acid via the lungs gives the extra HCO3– more acids to interact with and neutralize, decreasing the amount of free HCO3– available in the body. Since the CO2 level has time to increase and counterbalance the pH, the results are that there is too much HCO3– AND CO2 in the blood, but the pH remains in the normal range of 7.35-7.45. The pH will lean towards the alkaline side however, so you’re more likely to see a pH of 7.41-7.45. As the kidneys are less able to excrete HCO3-, the blood pH gradually increases and becomes more alkaline. At the same time, however, the the lungs begin compensating by retaining CO2 and H+, which are acidic, to balance out the pH. So you end up with too much HCO3– AND too much CO2, but the pH is still abnormal and in the alkaline/basic range (>7.45). What are the causes of Metabolic Alkalosis? What is the most common cause of Metabolic Alkalosis? Any illness or condition that can cause the body to either 1) retain too much bicarbonate OR 2) lose too much acid can be a cause of Metabolic Alkalosis. Since there are so many different individual conditions that could have that effect, it’s best to group them into categories that have similar underlying pathophysiologies. The Gastro-Intestinal (GI) system is a major player in metabolic acid-base imbalances. In fact, it’s easy to predict when Metabolic Alkalosis could occur simply by thinking through the normal anatomy! For example, the stomach is a more acidic part of the GI system than the intestines because of the stomach acid. Therefore, if a patient has severe vomiting, they will lose proportionally MORE (stomach) acid from their body than base, leading to Metabolic Alkalosis. Another possible GI-related cause of Metabolic Alkalosis would be taking too much antacid, such as calcium carbonate. The reason why is all in the name: ant-acid. Antacids are alkaline, and so they work by neutralizing the acid in the stomach. This effects the body’s overall acid-base balance by increasing base and decreasing acid. The kidneys are the primary organ responsible for regulating HCO3– in the body. So if they aren’t working properly, then there is a high risk that an acid-base balance will occur. Any kind of kidney failure or renal insufficiency can be a cause of Metabolic Alkalosis. Hypokalemia is in an interesting position, because it can be either a cause OR a symptom of Metabolic Alkalosis. The only difference is the timing! For example, if the Metabolic Alkalosis occurred first, and the hypokalemia developed as a result, then it would be considered a symptom. But if the hypokalemia occurs first, then hypokalemia could be the CAUSE of the Metabolic Alkalosis! For example, if a patient was on a loop diuretic and lost too much potassium, then the body would start compensating for the hypokalemia by “trading” the K+ inside the cells for H+ outside of the cells. The lowered levels of potassium are what trigger the “trading” to begin. This “trade” helps correct the potassium imbalance by making more K+ available in the blood stream. However, it also throws off the pH balance by taking some H+ out of the blood stream, which then becomes more alkaline or basic. “Getting rid of” acid (or making it unavailable, in this case) is one of the two possible ways to develop Metabolic Alkalosis. What happens during Metabolic Alkalosis? What are the symptoms? Nursing textbooks (and professors) are great about listing LOTS of Metabolic Alkalosis symptoms. The problem is, many of these signs and symptoms are rather generic, and could be true of many illnesses that are completely unrelated. I already mentioned earlier how hypokalemia can be a cause of Metabolic Alkalosis. Confusingly enough, it can also be a symptom! When hypokalemia occurs as a symptom, it’s because there is not enough H+ in the blood due to the Metabolic Alkalosis. So the body’s cells start moving H+ out of the cells and into the blood stream to try and maintain homeostasis. So far, so good. However, as H+ levels decrease inside the cells, it changes the action potential of the cell membrane. In order for the cells to keep their correct action potential, they start taking in K+ to replace the positive charge they are losing from the H+. This serves to increase available H+ in the blood, but decreases available K+ in the blood. For hypokalemia to be a symptom, the abnormally low levels H+ are what trigger the trading to begin. For hypokalemia to be a cause, it’s the abnormally low levels K+ that are the trigger. Since the lungs are one of the body’s primary methods for adjusting acid-base imbalance, you can expect to see changes in breathing patterns as they attempt to compensate for the Metabolic Alkalosis. Specifically, you will start to see slower, more shallow breathing. This pattern of breathing causes more CO2 to be retained in the body, which means that H+ will also be increasing. Since CO2 is a marker of how much acid is in the body, then this is also an indication that the body is attempting to balance out the Metabolic Alkalosis. Keep in mind that each acid-base imbalance is associated with a different breathing pattern, so don’t get them confused with each other! For example, Respiratory Acidosis can cause hyperventilation attempts. Kussmaul’s Respirations are a late sign of Metabolic Acidosis. And Cheyne-Stokes breathing is associated with Respiratory Alkalosis. Whenever H+ levels are decreased, it interferes with the ionization of Calcium (C+2). When there is less C+2 available, the end result is that nerve cells become more excitable, or easier to trigger. When decreased C+2 hits a certain level, it becomes hypocalcemia. At that point you can expect to see all the same major symptoms with Metabolic Alkalosis that you would expect to see for hypocalcemia: tetany (Trousseau’s Sign and Chvostek’s Sign), parethesias, and possible seizures. Healthy kidneys can also attempt to correct a metabolic imbalance. The kidneys do this by starting to excrete more HCO3-. Along with the HCO3-, they also end up excreting extra H2O and Na+. With all the extra water and sodium leaving the body along with the bicarbonate, you will see polyuria. The polyuria has potential to cause hypovolemia. If hypovolemia occurs, you can expect to see the same symptoms for Metabolic Alkalosis that you would see for hypovolemia by itself: thirst, dry mucus membranes, and low blood pressure. Not surprisingly, a patient with Metabolic Alkalosis will have abnormal ABG results: HCO3– greater than than 26 and pH greater than 7.45 (or pH between 7.41-7.45 if Compensated). Do you see how impossible it is to identify these generic Metabolic Alkalosis symptoms? They also occur with just about every other illness you’ll study in nursing school. Which is why exams will always highlight the specific and unique clusters of symptoms…and you should focus on them as you study, too! What is the treatment for Metabolic Alkalosis? If it’s present, then hypokalemia is a BIG priority to manage. The short-term goal of treatment will be to normalize blood potassium levels. Typically, this is going to mean carefully administering IV potassium until blood levels of K+ normalize. This would most likely be the treatment of choice if the hypokalemia was the cause of the Metabolic Alkalosis, because in that case administering IV potassium should correct both the symptoms AND the original cause. However, if hypokalemia is instead a late symptom of Metabolic Alkalosis, then you might not directly treat the hypokalemia at all! It’s possible you could instead keep a close eye on blood potassium levels, while correcting the root cause of the acid-base imbalance. The specific treatment is always going to depend on the original cause. However, every treatment goal is to get the body back into homeostasis as much as possible, given the patient’s comorbid conditions. If the Metabolic Alkalosis is caused by hypokalemia, then plan to administer IV potassium! As we discussed above, it hypokalemia could be either the cause OR a late symptom. In either case, IV potassium could be useful…especially if hypokalemia is the cause. If the patient has severe Metabolic Alkalosis, then another priority will be to quickly correct the blood pH. There are two primary medications that might be used to help with that. The first is ammonium chloride, diluted to 0.9%. Ammonium chloride solution is a weak acid, which will start binding to all of the extra HCO3– floating around in the blood vessels. As the HCO3– gets used up, the blood pH will decrease and become more acidic. There are some important precautions to note for ammonium chloride, but most of them should be common sense. Don’t infuse it too quickly, and don’t use it if the patient already has kidney or liver problems. The second possible medication that could be used would be acetazolamide. This medication helps the kidneys to get rid of more HCO3-, with the goal of reducing total bicarbonate in the body. Less bicarbonate means the blood pH can increase and become more acidic. Bonus points for understanding how breathing patterns effect ALL of the acid-base imbalances! 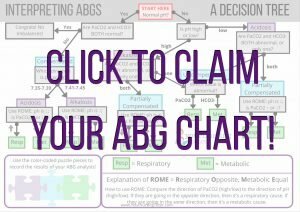 Sign up for a FREE ABG Flow Chart below to help you confidently identify Metabolic Alkalosis!